Although Mary is extremely low maintenance, she had one firm request for cruising. 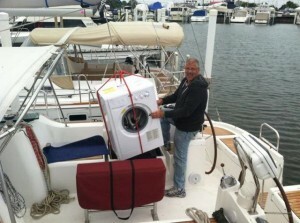 If it was possible, she wanted a washer / dryer on board. Being the agreeable sweetheart that I am, I immediately embraced the project and began planning. First, we chose found a unit that was made for boats. 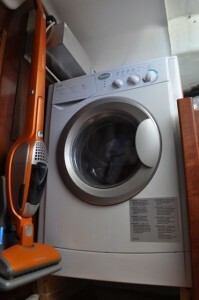 It is a fairly compact combined washer / dryer from Splendide. Next, where to install? 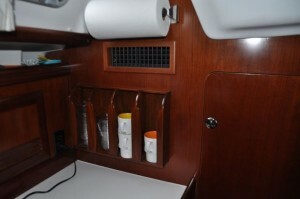 Our boat model came with various interior layouts. Echo is a 2 cabin model. 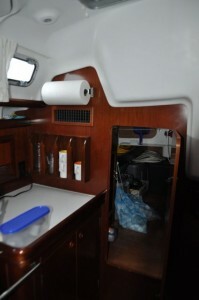 In this layout there is a room in the back next to the galley that we call the garage. 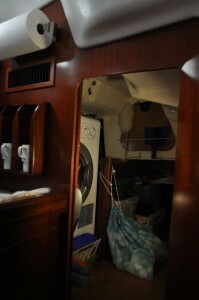 The washer could tuck in the corner just aft of the galley. There is access to the garage from the galley. And a large overhead hatch from the cockpit would allow us to drop the washer in place. A couple preparatory mods were needed to make space. 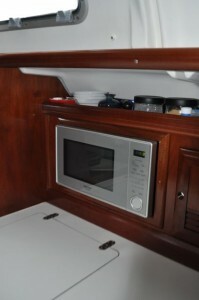 First, the microwave was installed in the wall between the galley and the garage. Since the back of the micro extended back into the garage, we needed to find a new spot. Up forward in the galley we converted one of the cupboards to a new micro spot. Now having moved the micro, we needed some way to close out the hole where the micro used to live. I built a cupboard. Oddly enough, cups fit here. Easier said than done, but drop in in, hook it up, and no more Laundromats for us! We ‘love’ this project! 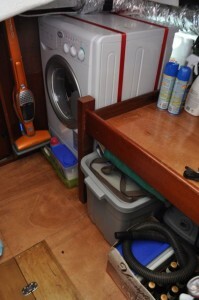 A washer dryer is an absolute must when you’re living aboard! We are taking notes of all your projects!